All the best bits both modern and classic from the Brit Rock invasion and a couple of cheeky Oirish ones thrown in from this 3 piece all-Brit, Nelson based band of accomplished musicians showcasing great British music from the likes of The Cure, The Jam, The Police, The Clash, Stereophonics, The Cult, Billy Idol, The Who and many more. The Underground have fast established themselves as a firm favourite on the Nelson scene as “a breath of fresh air” and “not just another cover band” from fans or as one Nelson event manager puts it “you just don’t get bands playing this sort of music in NZ”. 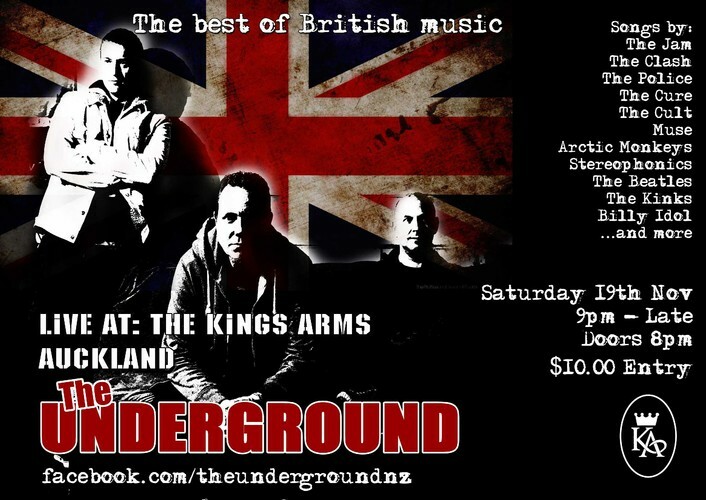 They now bring their show to The Kings Arms for their first trip to Auckland so if you are a fan of British rock music then lock The Underground in your diary and don’t be the ones on Monday wishing you had!